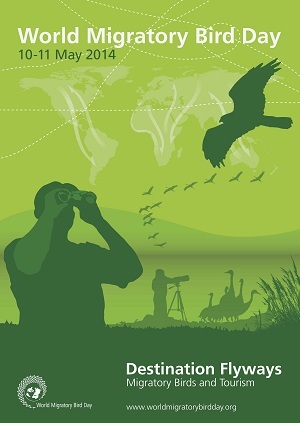 "Destination Flyways: Migratory Birds and Tourism"
With the theme “Destination Flyways: Migratory Birds and Tourism”, World Migratory Bird Day (WMBD) 2014 will highlight the links between migratory bird conservation, local community development and wildlife watching tourism around the world. Every year, more than one billion tourists cross international borders. A thriving wildlife is a key tourism asset, and the spectacular movements of the world´s migratory birds are no exception. 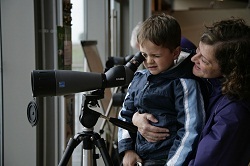 Properly managed, popular bird-related tourism activities such as bird watching or bird photography can serve as the foundation for a mutually beneficial relationship between people and migratory birds. For the 2014 Campaign, WMBD is partnering with the World Tourism Organization (UNWTO) to highlight the Destination Flyways project. Led by UNWTO and implemented together with several partners with sound experience in the field of conservation and tourism, Destination Flyways will develop sustainable tourism in destinations along the world’s major migratory bird routes, also known as flyways. By channeling tourism revenue back into conservation of the sites, the project aims to safeguard the birds’ habitats, while creating resilient and green job opportunities for local communities. We encourage everyone to use the WMBD 2014 poster and logo for their own materials and designs to support their local events. For the 2014 WMBD Campaign, Destination Flyways will function as a prime example of how tourism developed around migratory birds can be a vehicle for both environmental and socio-economic sustainability, benefiting wildlife, local communities and tourists alike. Organized by the World Tourism Organization (UNWTO), the "Destination Flyways" project will promote sustainable tourism at eight important migratory bird sites in Africa, Asia and Europe that migratory birds need in order to survive. 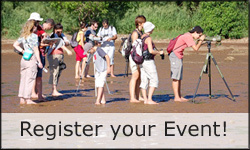 World Migratory Bird Day and its partners would like to invite you to join us in celebrating migratory birds and the need for their conservation on 10-11 May 2014 thorough organizing bird-watching tours, educational programmes, lectures, art exhibitions or other public events - every activity will enrich this global celebration! World Migratory Bird Day 2014 will partner this year with the “Destination Flyways" project of the World Tourism Organization (UNWTO) to develop sustainable tourism at important locations along bird migration routes, called flyways. Bird-related tourism at these sites will create links between migratory birds and the local communities around them. These links will build long-term sustainable livelihoods for local communities, and will conserve important sites along flyways that migratory birds need to survive. Lake Natron is an ideal example of how to show the potential to develop bird-related eco-tourism as a means to help local communities find new economic opportunities while at the same time conserving important migratory bird habitats. World Migratory Bird Day is supported by a growing network of Partners and Organizations, including the World Tourism Organization (UNWTO) for the 2014 campaign, dedicated to the conservation of migratory birds and their habitats. The World Migratory Bird Day campaign is organized by the Agreement on the Conservation of African-Eurasian Migratory Waterbirds (AEWA) and the Convention on Migratory Species (CMS) administered by the United Nations Environment Programme (UNEP). To become a part of this year's campaign, register your own activity for WMBD 2014 on this website! Celebrate migratory birds and raise awareness about this year's theme 'Destination Flyways: Migratory Birds and Tourism'. For more ideas for your own WMBD 2014 activity browse through the other globally registered WMBD events which took place in past WMBD Campaigns!